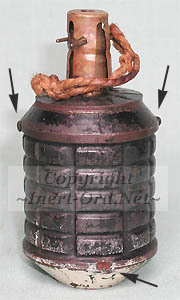 This versatile grenade could be fired from the 50mm "Knee Mortar", used as a spigot launched grenade, or used as a standard hand grenade. It had a seven second delay, which was necessary for its role as a projected munition. The threaded socket in the bottom of the body is for attachment of an auxiliary propellant increment for mortar use, or a finned tailboom assembly could be used to convert the T91 to a rifle grenade. 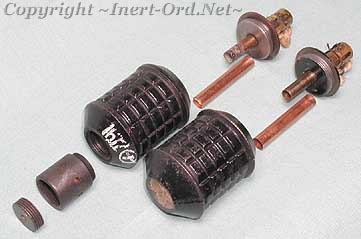 The fuze is a percussion activated delay type, started by pulling the pin then striking the cap. If used as a mortar round or rifle grenade the fuze is activated automatically when fired, the plunger being pushed in by inertia. The delay time of the fuse is too long for practical use as a hand grenade however. Since apparently it was used mostly as a hand grenade, rather than a mortar round or rifle grenade, the design was modified with a shorter delay. The new version being designated the Type 97. Both types have almost identical mechanical parts, with the exception of the threaded pocket in the base of the body for the booster component. 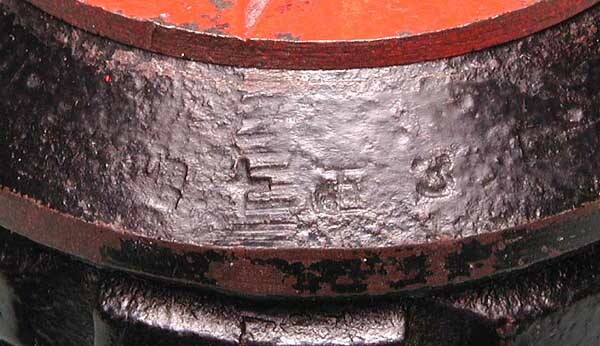 The symbol in the circle is likely a depot or arsenal marking. 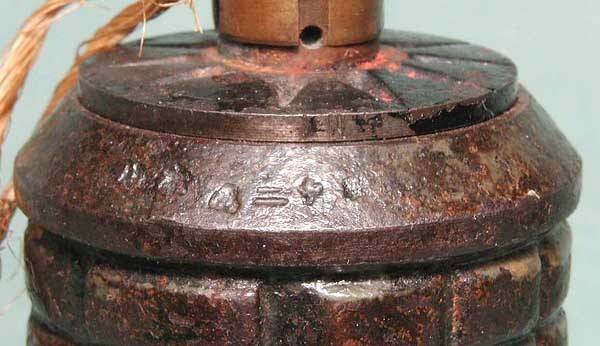 The seven second delay of the Type 91 fuze can be found with fuze markings on the stem to reflect this. At left, is the Kanji symbol for "7", probably the delay marking. To the right, on the opposite side of this fuze, is likely an inspection stamp signifying "complete". 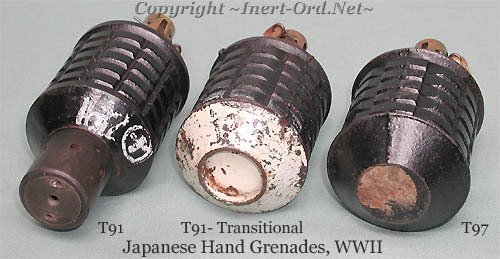 There were quantities of existing Type 91 grenades that were converted to the shorter delay fuze. To prevent inadvertent use as a mortar round, the threaded bases were drilled out, the cavity was painted white, and small welds were placed on the outer rim of the bodies, so the grenade would not fit in the "Knee Mortar" tube. There can be found examples with an advisory label inside the base cavity, indicating the reduced delay time of the fuze. This label continued to be used on the T97 grenade, the remains of which are visible on the example on the right. I am not aware of any official designation for these reworked grenades. Fuze marked Showa 14.9 (Sept 1939) If these are original assemblies it would indicate that there were large quantities of grenade bodies and fuzes in inventory that were assembled at later dates. From what I have, it looks like as the war progressed the fuze/body and filling dates become more in sync. with each other.